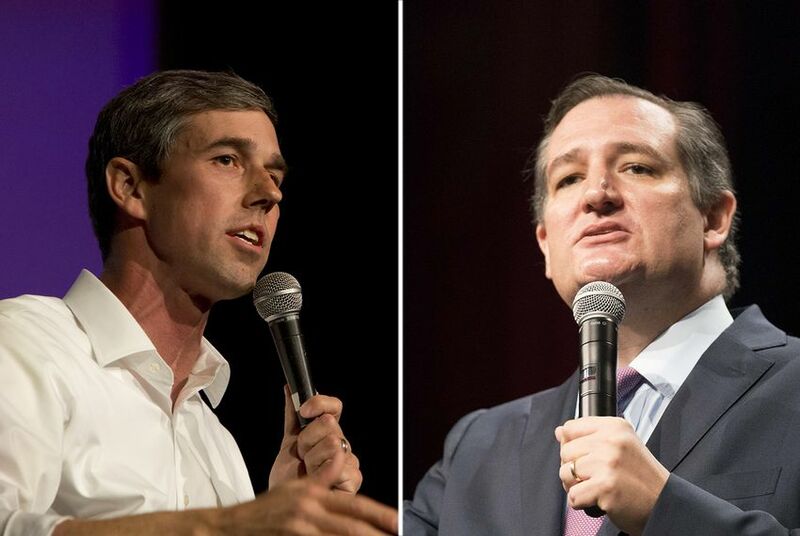 Does Cruz lead O'Rourke by 6 points or 2? Here's how to evaluate Texas polls. Here are four things to keep in mind when you see a poll on a statewide race in Texas. The top-of-the-ticket U.S. Senate race in Texas has already drawn statewide and national attention. And polls seem to agree on one thing: U.S. Sen. Ted Cruz has a lead over his opponent, U.S. Rep. Beto O'Rourke of El Paso. But by how much Cruz leads depends on who you ask. A Texas Lyceum poll released Wednesday gave the Republican incumbent a 2-point advantage. A Quinnipiac University poll released hours later gave Cruz a 6-point lead. And a Texas Tribune/University of Texas poll released in June had Cruz ahead by 5 percentage points. Older polls have ranged from a virtual tie to an 11-point lead for Cruz. But results have at times drawn skepticism from Republicans. Before the latest Texas Lyceum poll was released, Cruz's pollster Chris Wilson published an article on Medium questioning whether it would be accurate. "Dating back to 2008 the Texas Lyceum has generously given Democrats a massive house effect boost of seven (7!!!) points," he wrote, adding that the poll has historically overestimated the share of the Hispanic vote. And at least one pollster concedes that early polls in Texas tend to favor Democrats. So who should you trust? When analyzing polls, experts advise not relying on the results of only one survey. And remember, no one is going to be 100 percent accurate — especially months away from an election. “That’ll give you your best estimate as to what things will look like in November,” he added. The numbers coming out now are just snapshots of a moment in time, experts say. And the results are highly likely to change. When it comes to assessing polls for their accuracy, the first thing to look at is who’s doing the research. The Tribune, Texas Lyceum and Quinnipiac University are nonpartisan. But not all groups that release polling data can say the same, Jones said. As Election Day nears, other groups will publish polls, too. Sometimes they will come from political campaigns, a political action committee or a group with a particular agenda. It’s important to be skeptical of polling that comes from these groups, Jones said, because they could be pushing flawed results — intentionally or not. When analyzing new polling information, Jones advises asking yourself the following questions: Is the data coming from a reputable organization with a long, credible track record? Is the organization nonpartisan or do they have an ideological or partisan bias? Does this firm work with one party or another? If the answer to any of the above questions is “yes,” then the polling results could be “somewhat suspect,” Jones said. “The ideal polls are those done by experienced pollsters working for an organization that is seen as incredibly nonpartisan — meaning they don’t make a large share of their money working for candidates or organizations that have any ideological or partisan agenda,” he added. How are the pollsters collecting their data? When it comes to gathering data, there are a few different avenues political analysts can utilize. The first — and arguably worst — way to collect data, analysts say, is through robocalls, which are phone calls initiated by automatic telephone dialing systems that often leave a prerecorded voice message. This is the most cost-efficient way to gauge how voters feel about a certain race, but since robocalls often leave messages on landline phones and don’t give the receiver the benefit of talking to an actual human being, the method is often scoffed at. “When you do robocalls, your questions and your response options are constrained,” said Daron Shaw, a government professor at the University of Texas at Austin and co-director of the University of Texas/Texas Tribune poll and the Lyceum poll. “If I do a live interviewer survey I can ask you, ‘Hey what do you think is the most important problem facing the state of Texas?’ If I’m doing a robo-poll, I can’t do that. I can’t ask open ended questions." The best way to gauge how voters feel, Shaw said, is through in-person polling. However, that method is expensive and difficult to do, so nearly all pollsters can’t afford to go this route. A majority of polls collect information either from the internet or through telephone surveys conducted by live interviewers, he said. Another thing to consider: how long the pollsters took to gather their data. There’s no set number of days pollsters should spend in the field. Some prefer to collect data over a longer period of time, but not everyone has that luxury, Shaw said. “That tends to produce the possibility you’re going to have higher skews to your data,” he added. But a long time in the field can have its drawbacks, too. Big news in the race or in the country could cause a shift in voter opinion in the middle of the data collection. The Lyceum poll spent 17 days in the field, the UT/Tribune polls spent a week, and the Quinnipiac Poll spent five days. If the poll doesn't disclose its methodology, that might be a red flag. Who are the pollsters asking? A third thing to assess when analyzing polling data is to look at who is questioned. Several polls will take answers into account from registered voters rather than people who are considered likely to cast a ballot. There are ways to verify someone’s voting record and see whether a respondent is likely to cast a ballot (like purchasing the voter list from the secretary of state) but doing so costs money and time. The good news, Blaylock said, is that the polls that go the extra mile to verify this information will often make that clear. Despite all the precautions researchers may take, there’s no fool-proof way to get a perfect poll. Even field research conducted by the most nonpartisan organization that has identified the “perfect” sampling of eligible voting Texans has room for error. And the risk of inaccuracy gets larger the further from Election Day the poll is conducted. The earlier in the year a poll is conducted, experts say, the more likely it is Texans will say they’re unsure of which candidate to throw their support behind. And polls conducted in the early spring and summer often underestimate the Republican electorate because the sample of Texans surveyed now differs from the composition of the general election electorate, Blank said. “Public polls will tend to focus on registered voters or a very loose definition of likely voters, so they tend to see an electorate that is more Democratic than the electorate that historically shows up on Election Day,” he said. Disclosure: Texas Lyceum, the University of Texas at Austin and Rice University have been financial supporters of The Texas Tribune, a nonprofit, nonpartisan news organization that is funded in part by donations from members, foundations and corporate sponsors. Financial supporters play no role in the Tribune's journalism. Find a complete list of them here. UT/TT Poll: Football is popular in Texas. The NFL isn't.